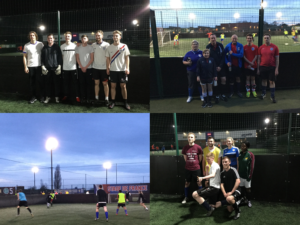 Run at GOALS Leicester, the three hour event will allow you to take on other workplaces for the chance to be crowned 5-A-Side Champions! Workplaces from Leicestershire, Leicester, and Rutland are invited to attend, simply encourage 4 other colleagues to join your team and enter by visiting our website. These events are a fantastic opportunity to socialise with your colleagues outside of the work environment, but to also network with other local workplaces & businesses too. 5-a-side soccer is an incredible game for developing and maintaining physical activity levels. The small-sided version of the ‘Beautiful Game’ is a variation in which each team fields five players (four outfield players and a goalkeeper). Other differences from the full game include a smaller pitch, smaller goals and a reduced game duration.